Live coverage of the fifth day of anti-government protests in Egypt, as tens of thousands of demonstrators return to the streets in several cities, after the Egyptian president fired his cabinet and promised reforms but refused to step down. 0010 We're going to close down our minute-by-minute coverage of events in Egypt for the night, but you can continue to read regular BBC updates here. With ongoing skirmishes between looters and vigilante groups, several hundred escaped convicts reportedly on the run, and a complete absence of police on Egypt's streets, the situation remains precarious. Sunday is the sixth day of protests against Hosni Mubarak's regime, which is seemingly teetering on the brink of collapse. Thanks for following developments on the BBC. 2358 Amid reports of numerous leading Egyptian businessmen fleeing the country on private jets, Mariah Westwind tweets: "GAME OVER Hosni #Mubarack! Shuffling Your Cabinet Is Like Rearranging the deck chairs on the Titanic! You had 30 yrs at this-GET OUT! #Jan25"
2348 Egypt's Nile TV is reporting that several hundred prisoners have escaped from a prison in Fayoum, south of Cairo. 2346 Omar Temamy in Cairo says: "I am out in the streets along with everyone else protecting and rescuing our homes. Thieves have been going round robbing houses. We have even caught four prisoners. We tied them with ropes and the army came and took them away. They were escaped prisoners. People are waiting outside their houses with weapons. We are hearing bullets. It is crazy. In front of every building there are 20 people to protect it. Some criminals have been stealing ambulances and police cars and driving around. People have erected checkpoints and no one can get through without ID. I am in Mohandisin but all over the city it is crazy. I don't think that we will sleep. It is relatively quiet now. People are brave. It is very scary. I have never experienced anything like this before." 2343 Amr El Beleidy in Cairo tweets: "Hearing more gunshots again that are getting closer, seems I am getting no sleep tonight! They've set up some barricades on some of the street entrances, but they look weak." 2339 Vodafone has issued a statement regarding its mobile phone coverage being cut in Egypt during the protests. "Vodafone restored voice services to our customers in Egypt this morning, as soon as we were able," says the statement. "We would like to make it clear that the authorities in Egypt have the technical capability to close our network, and if they had done so it would have taken much longer to restore services to our customers." 2320 Ramy Raoof in Cairo tweets: "People in Dokki who are in the streets guarding public/private properties just caught two thugs and are handing them to the army." 2318 AFP news agency is now reporting that the death toll from five days of Egyptian protests has reached 102, after 10 more deaths are reported near Beni Suef, 100km south of Cairo. 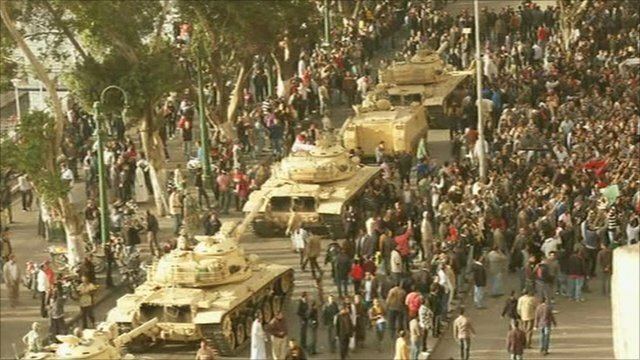 2316 Reporting from Cairo, the BBC's Lyse Doucet tweets: "Text message on Mobinil: 'the army calls on egyptian patriots to stand up against looters and traitors to protect our families and precious.'" 2313 There's an interesting piece from Abigail Hauslohner over at Time magazine, reporting that Bedouin have taken control of the two Egyptian towns closest to the Gaza Strip, and that they plan to press on to attack the Suez Canal if Mubarak does not step down. 2307 To recap on political developments, Egyptian President Hosni Mubarak has responded to the unrest by appointing his first-ever deputy and starting to form a new government. The holder of the new post of vice-president is his intelligence chief, Omar Suleiman. A former head of the air force, Ahmad Shafiq, takes over as prime minister. Leading opposition politician Mohamed El Baradei has dismissed the moves, saying they are merely a change of people when what the people want is a change of regime. 2254 Amid reports of numerous leading Egyptian businessmen fleeing the country on private jets, Josie Ensor tweets: "All these businessmen leaving Cairo like rats on a sinking ship. #jan25"
2248 If you've just joined us, thanks for stopping by. Here's a quick status update from Egypt: Vigilante groups in the capital Cairo have set up checkpoints amid reports of widespread looting. Police have almost completely disappeared from the streets, to be replaced by young men armed with metal bars and knives. The army is guarding key locations, and shooting has been reported around government buildings as protesters continue to defy a night-time curfew. The death-toll from five days of unrest is thought to be at least 75 nationwide, with many more injured. Stay tuned and we'll continue to bring you up-to-date with events on the ground in Egypt, and reactions from across the world. Jon Jensen in Cairo tweets: "Egypt state TV running images, names, and addresses of looters that have been captured." 2236 There's real anger on Arabic TV networks about a sniper who has reportedly been shooting at protesters from the roof of the interior ministry in Cairo, killing several. 2234 Referring to the lack of political points-scoring by Egyptian opposition groups in recent days, Shadi Hamid tweets: "Muslim Brotherhood's decision to stay relatively quiet was a smart move #jan25 #egypt." 2223 Analysing the international response to Egypt's crisis, BBC world affairs correspondent James Robbins sees a definite turning up of US and UK heat on Egypt's beleaguered leader in the latest statements from the White House and Downing Street. But do western governments also fear possible regime change in Egypt, and the risk of Islamists taking power? Yes, says our correspondent, but they also seem to think that if Egypt's people really are allowed to choose their leaders freely, then a moderate, progressive government is a much more likely outcome. 2217 An interesting observation from one of those involved in the neighbourhood watch groups that are now prevalent across Cairo. He told the BBC the absence of police on the streets was a deliberate strategy on the part of regime to frighten people about the repercussions of a security vacuum, prompting them to opt for the security that they know rather than the future that they don't. 2209 Speaking on the BBC News Channel, Jeremy Bowen says that President Mubarak clearly thinks he can hang on, having sacked his government, brought in new people and having nominated a vice-president for the first time in his 30-year leadership. "But one change I've seen on the streets in the past 24 hours is that it's no longer children of the rich who are protesting," says our Middle East editor. "The great mass of Egypt's poor are out there as well and that could suggest Mr Mubarak is in real trouble." 2200 More details on those casualties in Beni Suef: Reuters cites medical sources as saying police shot dead 17 people who were trying to attack two police stations in Biba and Nasser city. More were injured in the clashes, the agency says. 2151 Jan25 Voices tweets: "Most of Heliopolis is now being policed by youth with makeshift weapons and all apts have lights on for visibility." 2149 A word of warning for tourists who had been planning a winter break along Egypt's Red Sea coast-line. The UK Foreign Office has advised against all but essential travel to Cairo, Luxor and other cities, while saying the Red Sea resorts to which most British tourists travel remain calm. But the BBC's Alex Bellfield is on holiday in Sharm El Shiekh, where he says the atmosphere has changed dramatically in the past few hours, with barricades being erected and staff huddling around TV screens to catch the latest news on the protests. "We were told now we're not allowed out of the hotel until at least tomorrow night... They're getting nervous here, that something's going to happen." 2144 On the other hand, protesters argue that they've been waiting for reforms for years. 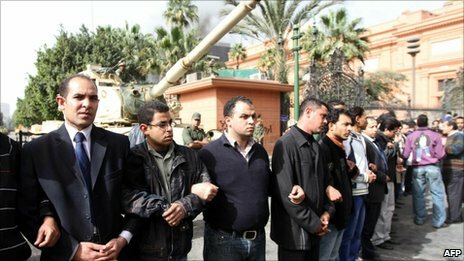 Now that they can see their demonstrations are making an impact, they will not give up until Mr Mubarak is ousted. Gigi Ibrahim, who took part in Saturday's protests in Cairo, told BBC News: "All they want is a humane life, they want justice, they see the disparity between the rich and the poor, they know that they are repressed and they're struggling every day to live a humane life. So they want an end to this and there is a direct link to Mubarak regime." 2140 Kareem Bissada, who lives in Cairo, believes the protestors don't represent the majority of people in Egypt, telling BBC News: "Many sectors in the society want Mubarak to stay because, me as a person, I believe that this person, specially Mubarak, has preserved peace for Egypt for many years and it was not the case before." 2133 The BBC has put together a gallery of some of the best images from across Egypt on day five of the so-called days of rage. Take a look at the gallery here. 2126 Thanks for following developments from Egypt with the BBC. We'll be bringing you the latest updates late into the night, incorporating reports from our correspondents on the ground, expert analysis and your reaction from around the world, which you can send via email, text or twitter. We'll publish what we can. 2119 Cairo citizens have taken the advice of the army to protect their own homes seriously, with impromptu neighbourhood watch groups, armed with machetes, hockey sticks and other weapons, protecting different parts of the capital. 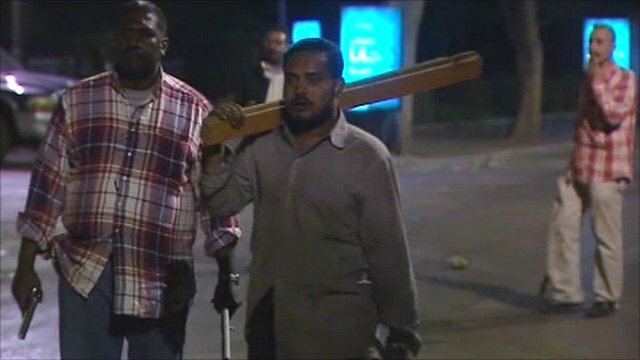 Nader, a Cairo resident, told the BBC the looters were "poverty-stricken people from bad neighbourhoods". 2112 Sarah Abdallah tweets: "It is 11pm in the capital city of #Cairo and thousands are still protesting against #Mubarak. The dictatorship is falling." 2110 In the absence of police on the capital's streets, there are reports that teams of youths are stopping and searching cars. 2107 There's strong response to the latest events in Egypt over at Foreign Policy magazine, pulling together analysis and commentary from a panel of Middle East experts. Read the piece, Pharaoh's End, here. 2058 Michelle from Somerville, NJ, writes: "As an American citizen, I think the US government's response is entirely appropriate. Things are still very uncertain in Egypt, and taking sides one way or another risks alienating a key ally should the gov. support the wrong side. It is entirely appropriate to call on President Mubarak to respect the protestors' demands while urging all sides to behave peacefully towards each other. I hope that Egypt returns to safety and security soon, with increased democratic rights for the people there. My thoughts are with all the families who have lost a loved one, be they protestor or security forces, to the violence that has occurred." 2052 Egypt's top archaeologist, Zahi Hawass, has told state TV that despite attempts by civilians to protect the building, looters had broken into the museum and damaged two mummies that had been on display. 2047 The headquarters of the ruling National Democratic Party are ablaze in central Cairo, and there are mounting concerns that the flames could spread to the nearby Egyptian Museum, which houses some of the country's most important cultural and historical artefacts. 2037 Brian from Honolulu, US, writes: "I have been hearing many calls so far, from Egyptians to those abroad, for a much stronger call of support from the US administration towards the demonstrators. I think it must be kept in mind that the demonstrators have offered no real option as an alternative to the current Egyptian government. They have only demanded that the current leadership step down. The US administration must be careful how they tread, as there is potential for a power vacuum to develop, where any number of opportunists might find an open door through which to walk." 2034 Protesters have set fire to the Egyptian Tax Authority headquarters, an office tower in central Cairo near the interior ministry and other government buildings, Reuters reports, citing witnesses. Smoke can be seen billowing from the building and the flames are visible from some distance away, witnesses say. There has also been gunfire reported in the area. 2030 Nicholas Pengelley from Toronto, Canada writes: "Remember 1989, when America, the vaunted Voice of Freedom, spoke loudly in support of the people who rose in Berlin, Prague, Warsaw and Budapest to bring down the tyrants who ruled over them. Where is that voice now, in support of the people of Egypt?" 2019 Ghorab tweets: "Got told by a trusted source that looters were arrested in Manial and found to be NDP [Mr Mubarak's ruling National Democratic Party] members. #Jan25"
2016 Firas Al-Atraqchi tweets: "Three of my neighbours formed family militia to protect residences." 2014 US President Barack Obama has convened his national security team at the White House to discuss the ongoing crisis in Egypt. The meeting lasted just over an hour, we are told. The president was updated on the situation in Egypt, and reiterated the US focus on opposing violence and calling for restraint; supporting universal rights; and supporting concrete steps that advance political reform within Egypt. 2010 The ruling National Democratic Party's Maged Boutros tells the BBC that if the protests get any worse, the rule of law will break down. "People have to wait and be patriotic, and not allow mobs and looters to dominate the streets," Mr Boutros tells BBC News. He says Mr Mubarak was legitimately elected, and people are using an illegitimate way of expressing their views by violence, warning against what he describes as "mob rule". 2007 Arabzy tweets: "Protesters wrap white ribbons around their hands to identify themselves from riot police if clashes happen #Jan25 #Egypt #Smart"
1958 Johan Baumeister from Minneapolis, USA, writes: "As an American citizen, I am deeply ashamed of my government's lukewarm response to the protests in Egypt. President Obama and Vice-President Biden have an opportunity to influence the outcome in favour of a more democratic Egypt. Thus far, they have squandered that chance. I urge all my fellow Americans to contact their senators, representatives, and the White House. It is time to call on Washington to stop supporting tyrants and dictators. It is time for out vaunted American gospel of democracy to be more than empty words and hollow gestures. It is time for a free world, and a Free Egypt!" 1953 David Carmichael from Essex, UK, writes: "We are speaking with our extended family in Cairo. Looters are in their apartment building. They have barricaded themselves in their apartment but they are afraid the building will be set on fire. They are terrified. The local police station was set on fire this morning - they believe the policeman were shut inside. I appreciate, having lived there, that perhaps a regime change is necessary... but how many people will die / suffer in the interim?" 1950 Twelve reported dead in fighting between demonstrators and police in Beni Suef, 100km south of Cairo, AFP reports, citing security officials. 1943 France, the UK and Germany have called on Mr Mubarak to "engage in a process of transformation". In a joint statement, French President Nicolas Sarkozy, German Chancellor Angela Merkel and UK Prime Minister David Cameron have urged Egypt's authorities to avoid at all costs the use of violence against civilians. "There must be full respect for human rights and democratic freedoms, including freedom of expression and communication, including use of telephones and the internet, and the right of peaceful assembly," they say. "The Egyptian people have legitimate grievances and a longing for a just and better future. We urge President Mubarak to embark on a process of transformation which should be reflected in a broad-based government and in free and fair elections." 1938 US filmmaker Michael Moore tweets: "Comedy doesn't get better than this: Mubarak appoints as vp man who ran OUR secret kidnapping/rendition prgm in Egypt (source: Jane Mayer)"
1936 The BBC Arabic service reports that Egyptian state TV is giving major coverage to reports of looting and attacks. Some activists believe these reports are being deliberately exaggerated to get people off the street, while others accuse the secret police of being behind some of the looting. Army reinforcements are being deployed to areas where looting has taken place, state TV reports. 1927 The Secretary-General of the Arab League, Amr Moussa, says the protests will die down if new policies are introduced in Egypt. "A new policy in my opinion has to be announced, addressing the needs of the young people, addressing the needs of the society in a way that would convince the people, this would calm down everybody," he told the BBC's Newshour programme. Mr Moussa said the protests were a sign of people in Arab countries demanding control over their governments. "When you look at what is happening you feel upset but you feel hopeful at the same time that those are the young people that get out on the streets, calling for reform. So this is a kind of a bell ringing, something new in the exercise of power by the people, by the Arab people. You have seen that in Tunis, you are going to see that in more than one country, in Egypt, in many other Arab countries." 1922 Sallie Pisch, managing editor of Cairo-based Bikya Masr news website, says thousands of people remain on or near Tahrir Square, where the atmosphere seems very upbeat. "The army has been received warmly by the people here, so some people are returning home because they don't feel it's so much of a battle at the moment," she tells BBC News. 1917 Alaa Abd El Fattah tweets: "And here is a call for general strike tomorrow to defend the revolution #Jan25. 1905 AFP cites medical sources as saying at least 73 people have been killed across Egypt in the past two days, with thousands more being injured. 1903 The BBC's Lyse Doucet in Cairo says there's a security vacuum in some parts of the city, with sporadic gunfire and looting taking place. There's a heady feeling among some protesters that they may be nearing their goal of toppling the Mubarak regime, but the president has not yet given any sign that he intends to go. 1857 Chaotic scenes are reported at Cairo Airport, where many travellers are stuck because of the demonstrations. A Spanish doctor, Jose Maria Abadaal, has been trying to leave for Madrid for the past 24 hours. "We are totally confined here because we cannot go either inside the boarding area or outside to the hotels," he told the BBC. "We don't really know what's going to happen tomorrow. They are cancelling many flights." 1851 Al Arabiya TV reports there has been shooting in Cairo's Agouza neighbourhood, citing witnesses. 1848 If the new government can't calm the anger in the streets, it's hard to see how President Mubarak can stay in power, adds our world affairs editor. It is hard, too, to think that the Americans, who keep Egypt afloat with their money, would want him to. Omar Suleiman, the new vice president, once saved President Mubarak's life in an assassination attempt. Saving him a second time may prove more of a problem. 1844 The BBC's world affairs editor, John Simpson, brings this analysis from Cairo. In spite of the turmoil, one or two things are becoming clearer, he says. It looks pretty likely that President Mubarak and his military leaders have been told in no uncertain fashion by the Americans that the Tiananmen Square option - by which the authorities restore order by shooting the protesters down by the hundred - is simply not acceptable here. Mr Mubarak's only hope therefore is to form a government which the demonstrators might accept, hard though that is to imagine. 1838 The Associated Press news agency has quoted unnamed Egyptian security officials as saying the death toll from the past two days of anti-government protests stands at 62, but we can't confirm this figure. 1833 Nasir from Sweden, writes: "Joe Biden: 'Mubarak should not step down.' Why can't US call upon Mubarak to step down rather than telling him to enforce new reforms in so-called favour of Egyptians? When will this game of ideological imposition stop? The people do not want just money, they want US ouster from their regions. If the US is sincere, leave them alone. Do not be a party to more bloodshed." 1828 Mohamed Bakeer, from Wigan writes: "Just spoken to my family in two different parts of Cairo and been told thugs and looters are on the streets, breaking in houses and attacking people and taking all they can. Army have issued an emergency number for residents to call, army has been called in full in the streets and engaging with live fire with looters and thugs in parts of Heliopolis." 1825 David Whitley, from Vienna, Austria writes: "If Mubarak is, as he now proclaims, so interested and dedicated to making Egypt free and giving employment and civil liberty opportunities to the Egyptian people, then why has he waited for thirty years and until he realises that he is on his way out?????" 1822 We'll be bringing you the latest Egypt updates late into the night, incorporating reports from our correspondents on the ground, expert analysis, the most recent images and your reaction from around the world, which you can send via email, text or twitter. We'll publish what we can. 1819 Mr Mubarak has for the first time appointed a deputy for himself, and started forming a new government. The new vice-president is the intelligence chief, Omar Suleiman, while another military man, Ahmad Shafiq, has been appointed prime minister. He also served in the previous government. The secretary-general of the Arab League, Amr Moussa, told the BBC the personalities mattered less than the policies they would put forward. Egypt and the Arab world, he said, needed thorough reform. 1817 The Egyptian army has warned people not to congregate on the streets but has not intervened so far. The curfew is also being ignored by demonstrators in Alexandria and Suez. There have been reports of police stations being set on fire in other parts of the country, including in Giza and Rafah. 1815 If you're just joining us, here's a quick recap to bring you up to speed: After five days of protests that have killed more than 50 people, tens of thousands of protesters are still on the streets of the Egyptian capital, Cairo, defying an extended curfew and demanding the resignation of President Hosni Mubarak. Demonstrators and security personnel have clashed outside the interior ministry and there are reports of casualties. 1809 Reacting to events in his native Egypt, the influential Qatar-based Sunni cleric, Sheikh Yusuf al-Qaradawi, said the only solution was for the president to step down. "And so I advise President Mubarak to leave his position and to leave Egypt. There is no other solution to this problem but for Mubarak to go," he said. 1804 Prof Steve Flint, from Liverpool, writes: "Tear gas blew into the Luxor Sheraton last night and big protests in town. Luxor airport in comms meltdown this morning with domestic flights cancelled and delayed, yet coach loads of tourists kept arriving. I managed to get out on a direct flight to Doha on Qatar Airways and am in Doha now, flying to Manchester later tonight. Central Luxor was very tense this morning, with trucks of riot police across town at 08.00. If things escalate it will be difficult to get all the tourists out quickly." 1801 Horreya Nour, from Cadiz, Spain, writes: "I called my brother in Cairo right when Vice President was swearing in front of Mubarak. He told me that people has lost their fear and they will not settle for anything less than seeing Mubarak and his parlament and government all out of the country. They want a new start with clean democratic elections and they don't accept anything less. I feel proud that finally my people are freed from their fear and have taken the streets to make their VOICE heard." 1800 A few details on the new Egyptian Prime Minister, Ahmed Shafiq, from our colleagues in BBC Arabic: Born in Cairo in November 1941; Graduated from the Air Force Academy in 1961; Took part in the 1967 and 1973 wars with Israel; Served as a military attache in Rome between 1984 and 1986; Became commander of the Air Force in 1996; Became minister of civil aviation in 2002, until his appointment a few hours ago by Mr Mubarak as prime minister. Reports suggest Shafiq has a reputation of aloofness from day-to-day politics in Egypt, which might play in his favour. 1756 Opposition leader Mohammed ElBaradei renews his call for President Mubarak to step down. The nomination of a vice-president and a prime minister is not sufficient, he adds, calling on the army to protect the people. "The Egyptian people will remember who stood by them and who stood by the regime when it falls," he says in a speech. 1755 Ian Lee tweets: "I am back from the battle at the Ministry of Interior. Police used live rounds, tear gas and rubber bullets to disperse protesters. #Jan25." 1748 Reuters news agency reports that Secretary of State Hillary Clinton, Vice President Joe Biden and other top US officials have held a two-hour White House meeting on the situation in Egypt. President Barack Obama is to receive an update on the crisis from his national security staff later on Saturday, the White House says. 1747 Here is a large format map detailing all the major flashpoint cities in Egypt today. 1742 CNN's Ben Wederman tweets: "Almost all police stations ransacked, arsenals looted. Suddenly weapons in the streets wielded by thugs. Where is the army?" 1742 Jon Jensen tweets: "Army no longer guarding streets near Egypt Ministry of Interior - there is a gunfight going on there now. For past 3 hours." 1738 Witnesses say there are snipers on the roof of Egypt's interior ministry building, and they have been firing live rounds at anybody who tries to approach the building, the BBC Arabic's Ranya Sabri reports from Cairo. 1732 International leaders and heads of state have been weighing in on the mass protests across Egypt. Here's a summary of the reaction from the likes of President Obama, UN Secretary General Ban Ki-moon, as well as European and Arab leaders. 1724 BBC readers describe the looting and fires in their neighbourhoods. 1718 The BBC's Khaled Ezzelarab says he has had to cross several barricades set up by residents to protect themselves from looters in the eastern end of Cairo. Arguments have broken out between the army and protesters because people have been asking the officers to stop the looting, but the army is trying not to get involved at all. 1708 BBC Arabic's Ranya Sabri says the people are not happy about intelligence chief Omar Suleiman being appointed vice-president. They want Mr Mubarak to leave and they are willing to put up with the chaos in the short-term to get the long-term change they seek, she says. 1633 Egyptian TV denies the flight of President Mubarak's sons to London. "There is no truth to what has been broadcast by some channels on the travel of Alaa and Gamal Mubarak to London," state-owned TV channel al-Misriyah says. 1625 This video posted on Youtube shows army tanks and APCs entering Rihab city, north of Cairo, today after looting was reported there. 1620 Israel's Foreign Ministry has evacuated Israeli citizens and the families of Israeli diplomatic staff from Egypt. A flight carrying the spouses and children of Israeli envoys, as well as 40 Israeli citizens who were staying in Cairo on private business, landed a short while ago at Ben Gurion airport, the ministry said in a statement. 1614 Arab League chief Amr Moussa tells BBC Arabic: "[All] Arab young people, not just the Egyptians, have feelings of frustration and anger because of the [economic and political] situation." He said he hadn't spoken to Mr Mubarak, but that the president knew that small reforms would not be enough. "I think that the Egyptian people of all factions and religions sent a strong message that won't be lost to anyone," he added. 1606 Egyptian Nobel-laureate Mohamed ElBaradei tells the BBC's Jeremy Bowen: The Egyptian people have revolted against President Mubarak. This is the first demonstration of this number. He either didn't get the message or he's pretending not to have heard. Everybody is of the same mind: he needs to go. 1602 President Mubarak has just appointed Ahmed Shafiq, the minister of civil aviation, as the new prime minister, minutes after he named intelligence chief Omar Suleiman as his vice-president. 1601 Hosni Mubarak's two sons, Alaa and Gamal, have arrived in London, the BBC Arabic Service is told. 1558 Iranian opposition leader Mir Hossain Mousavi says the people of Egypt have been inspired by anti-government demonstrations which took place in Iran in June 2009 after the disputed presidential elections. Mr Mousavi, who was defeated by President Ahmadinejad, said that if governments do not listen to legitimate demands of their people, the people would have no option but to call for their downfall, the BBC Persian Service reports. 1551 British tourist Ruth James is stuck at her hotel just outside central Cairo, next to a burning building. She told the BBC News Channel: "We saw some canisters of tear gas going off and... we heard, thud, thud and thought rubber bullets, so we fled to a restaurant where we stayed for a couple of hours before some British people who were living there and an Egyptian chap took us back to their flat for a while. And we couldn't get back to our hotel, it was deemed far too dangerous and we stayed in the Marriott, got up this morning at the crack of dawn and came here and my God, it was unbelievable. There'd been a battle here apparently yesterday and the building next to us, as I say, was still burning and looters were out. So it has been quite terrifying to be honest." 1538 Sharif Kouddous of Democracy Now! tweets: "Muslim Brotherhood chanting Allah Akbar. Crowd stopped them chanting louder: Muslim, Christian, we're all Egyptian #Egypt"
1530 Inianga Omiela from Yenagoa, Nigeria writes: "Democracy and freedom of speech are winds of change that are blowing across Africa and the rest of the world." 1527 Egypt has become a hot topic at the World Economic Forum in Davos. Here's a roundup of what delegates there are saying. 1522 Egypt's intelligence chief Omar Suleiman has been sworn in as vice-president, the official Mena news agency says. It is the first time in 30 years that President Mubarak has named a vice-president. 1515 Around 200 people are demonstrating outside the Egyptian embassy in central London, says the BBC's Ben Ando. Police are keeping away from the very front of the embassy after the word freedom was scrawled in marker pen across the brass plaque on the front of the building. There are no arrests as yet. 1510 Mohamed Mahmud Sami, a political prisoner held at Cairo's Abu Zaabal prison for the past 17 years, tells BBC Arabic: "Around 120 prisoners have taken control of this ward, the security forces are trying to storm in, but we can see that the soldiers are reluctant to fire at us, as if they want to side with the revolting people of Egypt." 1505 Ashraf Khalil tweets: "If anything the soldiers in Tahrir seemed super patient. I wouldn't let some kid climb up and post for pix on MY tank like that! #Jan25"
in addition to chest wounds. I myself have seen 38 people killed and brought to the hospital, other than the ones whose families took them themselves." 1452 Ashraf, from New York, writes: "Mubarak has systematically destroyed every aspect of life in Egypt, squandering all the countries resources over three decades, ignoring every wish of the people of Egypt. Everyone knows he is the west's puppet. They are the ones who kept him in power. Today, the final word is to the poor, hungry and haggard masses. No western power can stop the avalanche. He must go and go he will. More importantly, whoever comes next will have to abide by the will of the people of Egypt not anyone else." 1449 The army has repelled hundreds of protesters who attacked the entrance of a Central Bank-related building in a Cairo suburb, Reuters news agency reports. 1444 Looters are reportedly on the rampage in a number of upper-class neighbourhoods in Cairo. Residents are calling the offices of media organisations asking for help, amid what appears to be a security vacuum. Some have formed committees in an effort to protect their homes and buildings. 1438 At least three protesters have been killed during clashes outside the interior ministry in central Cairo, Al Jazeera television reports. 1433 A BMI plane travelling from London's Heathrow airport to Cairo has been turned back mid-flight. The company says the decision has been taken "due to the rapidly-changing situation in Egypt". A second flight, due to depart Heathrow for Cairo tonight, has also been cancelled. 1428 UK Foreign Secretary William Hague has released a statement again urging President Mubarak "to listen urgently to the aspirations expressed by the Egyptian people". He added: "He must seize this moment to make these reforms real and visible and to base them on the universal values that are the right of people in all countries." 1423 The deadline for the start of the curfew in Cairo has now passed, but protesters show no sign of dispersing - and the army is showing no sign of wanting to force them. In fact, our correspondent Khalid Ezzelarab reports, there is a friendly atmosphere between demonstrators and soldiers on the streets. 1416 Clashes outside the interior ministry are continuing. As protesters try to break in, police are attempting to drive them back with rubber bullets and tear gas. 1412 The BBC's world affairs editor John Simpson says he is shocked at the speed of events in Egypt. He says he has seen protesters carrying live ammunition that they have picked up off the streets, but their anger doesn't appear to be directed at those who fired it - the army. Instead, it is a vaguer, general hatred of President Mubarak himself. 1408 Ezz's resignation follows the burning and ransacking of one of his company main offices in the Mohandiseen area of Cairo, Reuters reports. He is the chairman of Ezz Steel. 1358 Ahmad Ezz, a prominent figure in the ruling NDP and a well-known Egyptian businessman, has resigned, Egypt's official Mena news agency reports. 1353 Clashes are being reported between protesters and security forces outside the interior ministry in Cairo. There are reports of injuries, but the army has not yet interfered. 1345 Egyptian protester Ahmed al-Ghadda tells the BBC News Channel that the only thing that will stop the protests is for a new parliament to be formed and for Mr Mubarak to come on TV and assure the people that neither he, nor his son Gamal, will run in the presidential election due later this year. 1331 Egyptian pro-democracy activist Mohamed ElBaradei has spoken to France 24, telling them that President Mubarak's midnight speech was "almost an insult to the intelligence of the Egyptian people". He said Mr Mubarak did not elaborate on a single economic or social reform and that he hoped the president would get the message before "things get ugly". 1322 Residents of Suez are parading the bodies of those killed in Friday's demonstrations through the streets of the city, chanting slogans against President Mubarak and asking him to quit, says BBC Arabic's Moawad Goudah. Residents have also formed local councils in Suez and in al-Mahallah, north of Cairo, to protect the commercial centres, banks and offices from looting. 1316 Demonstrators have set fire to the Giza police station, and attacked police officers inside, says BBC Arabic's Khaled Ezzelarab in Cairo. 1307 The state-owned Nile News TV is carrying non-stop coverage of the protests, BBC Monitoring reports. The channel is repeatedly airing a video package entitled: "Stay safe Egypt", showing Egyptians of all ages and walks of life with the national anthem playing in the background. 1259 Political activist Gigi Ibrahim in Cairo sums up the mood of protesters for the BBC's Newshour: "People are willing to die for this and they have. They have. The 30 years of repression are pushing people to the extreme." 1254 The BBC's Yolande Knell says thousands are marching along the Nile in central Cairo. Military and police are avoiding any confrontation. Although they are well armed, they are not using their weapons or firing tear gas. We are expecting people to ignore a call for an earlier curfew starting at 1600 (1400 GMT). 1241 Some amazing scenes from Egypt in our updated picture gallery. The protesters want President Mubarak to go. 1240 Officials say that the Cairo stock exchange will be closed on Sunday due to the violence. Sunday is a full trading day in the Middle East. 1229 The Egyptian military has closed tourist access to the pyramids, AP reports. Tanks and armoured personnel carriers have sealed off the site on the Giza plateau, which is normally packed with tourists. 1226 Egyptian medical officials say 38 people have been killed and 2,000 wounded in the protests since Friday, bringing the death toll in the week's unrest to at least 45. Ten policemen are among those killed in the past two days of clashes, they said. 1224 British Airways says it has chartered a plane to bring back any passengers who wish to leave Cairo. This is not an evacuation - it is for anyone who is already booked on a flight, but wishes to change plans. The UK Foreign Office says there are up to 30,000 Britons in Egypt, the vast majority in Sharm el-Sheikh, which is not affected by the protests. 1221 Rahim Hamada called the BBC from Cairo: "Civilians are surrounding the museum of Cairo in [Tahrir] Square and protecting it from looting. All the police have left the square, I think, to try and create disorder, but the civilians are taking control and organising traffic. They are also protecting property from looters and thieves, and taking back stolen goods, which are being placed in the yard of the museum for safety. We want this protest to be peaceful." 1216 BBC Arabic's Hisham Abdul Malak says political prisoners have taken control of the Abu Zaabal prison in Cairo, but the police have been able to keep them locked inside the prison. 1212 The BBC's Yolande Knell in Cairo says the smell of tear gas still lingers in the air. On bridges, passers-by photograph burnt out police vehicles. "Illegitimate," is the cry that rings out as one man shouts out the names of the interior minister, the security services and the president, Hosni Mubarak. 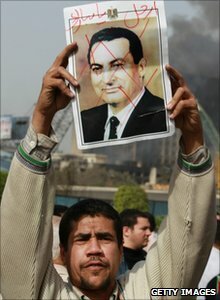 "Thirty years, thirty years Mubarak," the demonstators shout. "Now we want you to go!" 1204 Prison riots have erupted in the Shabeen al-Qom prison in the city of al-Manufiya, says BBC Arabic's Moawad Goudah. Security forces are using live fire to control the situation, while the families of the prisoners have gathered in front of the building. 1200 Foreign tourists and Egyptians have begun flocking to Cairo's main airport, scrambling to find flights out of the country, the AP news agency says. Between 1,500 and 2,000 travellers are at the two main departure terminals, most without reservations, trying to find flights out of the country, it says. 1155 A curfew in the cities of Cairo, Alexandria and Suez has been extended to start from 1600 to 0800 (1400 to 0600 GMT), Egyptian state television has reported, hours after the army threatened to arrest anyone who disobeyed the curfew. 1148 Hundreds of demonstrators are heading towards the morgue in the city of Suez, demanding that the bodies of those who died in the clashes be handed to their families, says BBC Arabic's Moawad Goudah. The death toll of yesterday's clashes in Suez has risen to 20 civilians, in addition to 140 injured, 73 of whom are policemen. 1142 Amr El Beleidy tweets on the curfew which will start at 1600: "So now the curfew allows us only 8 hours out of our homes! That's 16 hours locked inside!" 1133 Professor Tariq Ramadan of Oxford University, whose grandfather founded the Muslim Brotherhood in Egypt, and Algerian journalist Nabila Ramdani discuss the regional impact of the Egyptian demonstrations on BBC Radio 4. Click on the audio to listen. 1128 Judging by the presence of thousands of people on the streets again today, these people want radical political reform and they want it now, says the BBC's Wyre Davies in Cairo. There are soldiers trying to keep the peace but people are clearly dissatisfied with what Mr Mubarak had to say on television last night. They don't want the president to remain in power and they're not satisfied with his promise of economic reform. 1115 In Suez, the BBC's Rupert Wingfield-Hayes says the streets are tense but quiet after 13 people were killed in protests during the night. The police have fled and the army has moved onto the streets. The crowds have come out again this morning, but only to witness the damage of the previous night. The main police station is a smouldering ruin and army tanks and personnel carriers are parked on every major intersection. 1107 The BBC's Lyse Doucet says that the army is the main face of the security now. They have rolled out their tanks and armoured personnel carriers, and there is no sign of the dozens and dozens of riot police seen on Friday. The big question is what will they do when confronted by protesters? For the moment, they are holding back. 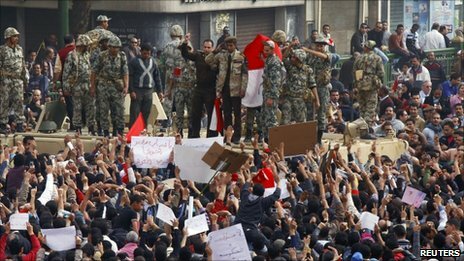 1055 Thousands of protesters have clashed with police in the northern city of Alexandria. A witness tells Reuters that the police have used tear gas and live ammunition against the demonstrators, saying the death toll in the city has reached 20 since Friday. 1049 Salil Shetty, the head of Amnesty International, calls Mr Mubarak's decision to fire his cabinet a "bit of a joke" and says it won't quell the protests. Mr Shetty tells the Associated Press that people want "very fundamental change, constitutional change". 1030 Julius Batemba from Lira, Uganda writes: "People need Mubarak to go, not for him to appoint a new government. Let him respect the will of the people." 1023 Thirty bodies were taken to el-Damardash hospital in central Cairo between 1300 and 2300 on Friday during the protests, a hospital source has told the Reuters news agency. She said two of the dead were children, one aged seven, the other aged four. 1018 Taher el-Sherif of the Egyptian-British Chamber of Commerce in London describes the incredible scenes of the past few days to the BBC News Channel: "Cairo is burning now. People are looting. Some youth turned themselves into human shields to protect the museum and other key government buildings." 1014 Egypt's outgoing cabinet has met to formally submit its resignation, after President Hosni Mubarak told the government to quit in the wake of the countrywide protests, the official news agency Mena reports. The meeting was chaired by Prime Minister Ahmed Nazif, it said. 1009 Callum McKinnell, from Coventry, UK, has been working in Egypt for five weeks. He told the BBC by phone: "You can feel the tension in the air at the hotel. Last night you could see worried faces and the usual staff weren't about. I'm not in a trouble spot, as I'm staying nearer the 6th of October City (outside Cairo). We've been told to stay in our hotel however, and I can't carry out the work I am supposed to - updating telecoms systems - because I have to do the work at night and there is a curfew". 1000 BBC Arabic's Moawad Goudah in the city of Suez says: Hundreds of demonstrators are gathering in front of al-Arbaeen police station, which was burnt down on Friday, chanting for President Mubarak to step down. There is a significant presence of Egyptian army forces in key areas in Suez, where 13 people were killed in the unrest on Friday, and more than 150 injured. Army officers in Suez have confirmed to BBC that they have received orders to prevent acts of violence and looting, protect public buildings, and refrain from opening fire on demonstrators. 0955 The BBC's Yolande Knell in Cairo says flames are still burning on the top floor of the NDP headquarters - the office of President Mubarak's ruling party - that protesters set ablaze on Friday. 0945 Lars Akerhaug a journalist from vg.no tweets: "Army pickup truck just arrived to the Tahrir square, they did let protestors hitch hike with them. Bad omen for Mubarak." 0945 Ian Lee a writer and reporter based in the Middle East, tweets: "Protesters say they won't go home until President Hosni Mubarak steps down. " 0935 Jan25 Voices , an apparently reliable source, tweets: "Live phone call: Tahrir protesters are massing in 1000s, but word being passed that the BIG demo is at 3pm." 0924 Amr El Beleidy tweets: "Mobinil network coverage is back, we're connected again!" He is also tweeting pictures of some of the damage around Cairo. 0918 Violent clashes have broken out in the Egyptian canal city of Ismailiya, witnesses tell the AFP news agency. 0910 With fires still smouldering after attacks on government buildings in Cairo's Tahrir Square overnight, new demonstrations have begun in the centre of the city, says the BBC's Yolande Knell. 0901 The BBC's Lyse Doucet says mobile phone networks appear to be working again in Egypt, about 24 hours after they were cut. Internet service still appears to be down.